He traveled the globe in search of the world’s fastest companies for his landmark book, It’s Not the Big That Eat the Small – It’s the Fast That Eat the Slow. Within weeks of its release, it hit the Wall Street Journal, USA Today and New York Times Bestsellers Lists. Now published in 32 languages, USA TODAY named it one of the top 25 books of the year! Next, he and his research teams identified the world’s ten most productive companies for his bestseller, Less Is More. That was followed by his book, Think BIG – Act Small, which profiled the only ten companies in the world to have organically grown both revenues and profits by double digits every year for ten consecutive years. Like all his previous books it debuted on all the bestseller charts. 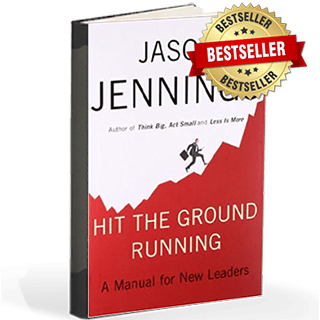 His next book, Hit the Ground Running – A Manual for Leaders revealed the tactics and strategies of the ten CEO’s who created the greatest amount of economic value between 2000 and 2009. His book, The Reinventors – How Extraordinary Companies Pursue Radical Continuous Change reveals the secrets of those leaders and organizations that have successfully reinvented and transformed themselves. 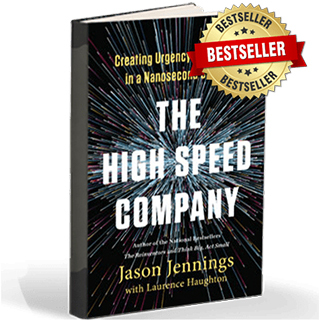 Jason’s latest book for his publisher Penguin Random House, The High-Speed Company, tackles the subject of creating cultures of urgency and growth that are able to compete in a nanosecond world. 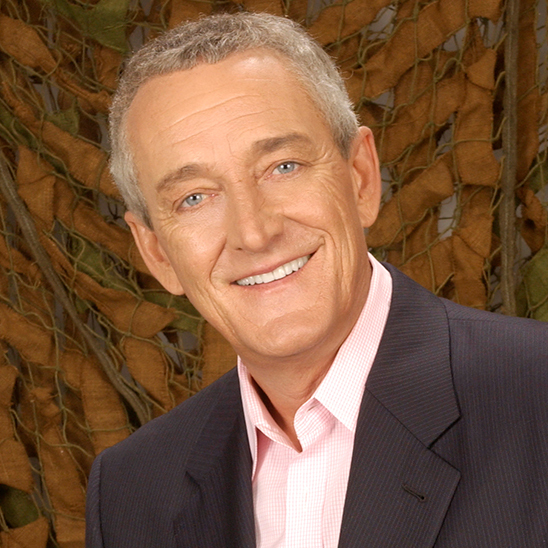 In total, Jennings and his researchers have screened and studied more than 200,000 companies. Along the way, he found time to join forces with well-known cardiologist Dr. John Kennedy and coauthor the 2010 Health, Mind and Body bestseller, The 15 Minute Heart Cure –The Natural Way to Release Stress and Heal Your Heart in Fifteen minutes a Day. 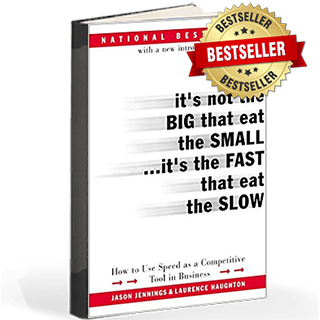 Based on content from Jason’s legendary, bestselling books, It’s Not The Big That Eat The Small – Its’ The Fast That Eat the Slow, and, The High-Speed Company – Creating Urgency and growth in a Nanosecond Culture, this speech can be delivered in a 60 or 90-minute keynote or as a half-day workshop. It will provide your audience five solid takeaways for making your company faster, more nimble and agile and open to change. 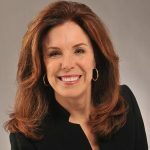 Having studied 220,000 successful companies and having personally conducted more than 14,000 interviews with the world’s most successful and best performing business owners, entrepreneurs and CEOs, this can be delivered in a 60 or 90-minute format or as a half-day or full day interactive workshop. It reveals the six secrets that area shared by truly great leaders whose leadership has withstood the test of time and market conditions. 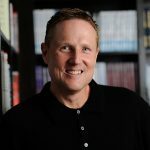 These six leadership secrets are a distillation of all of Jason’s research for all his books. Based on content from the bestseller, Think BIG – Act Small, that revealed the growth secrets of the only ten American companies to grow their revenues and profits by double-digits for 15 consecutive years despite two economic meltdowns, this speech reveals the specific strategies and tactics used by these remarkable companies to achieve their unparalleled growth. 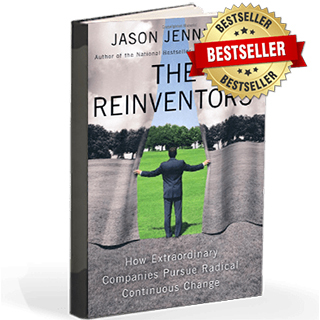 The Reinventors – How Extraordinary Companies Pursue Continual Radical Change, is one of Jason’s most successful New York Times, WSJ, and USA TODAY bestselling books and it’s the basis for a speech that can be delivered in a 60 0r 90-minute format of as a half-day or full-day interactive workshop. Every member of the audience will learn the steps required to embrace change, let go of same old-same old, yesterday’s breadwinners, egos and conventional wisdom and how to make lots of small bets instead of waiting or the day when the company is forced to risk everything on one big bet which has a history of not working. Audience members will leave knowing the steps they need to take to innovate and will be enthusiastic about change instead of fearing it. 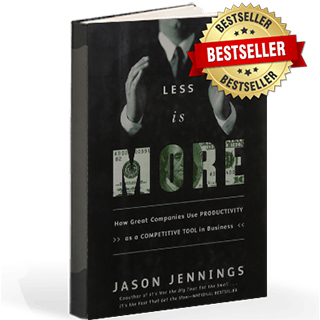 Jason’s NYT, WSJ and USA TODAY bestselling book, Less Is More – How Great Companies Use Productivity as a Competitive Tool in Business, first published in 2002, has become a cult classic and wherever he goes people ask him to autograph dogeared copies of the book with highlighted pages starting to fall out of their books. The twelve principles of the most productive companies in the world haven’t and won’t change. If you want your company to strip away waste and become a model of productivity this is the keynote for you. This can be delivered as a 60 or 90- minute keynote or as a half-day program. Jason’s speeches are based on the research he and his research teams have conducted into 220,000 companies around the world for his eight bestselling books. 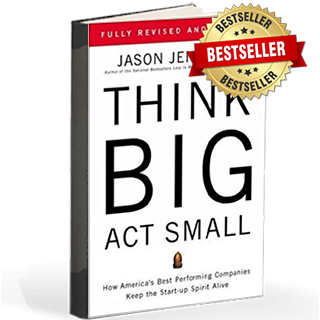 Additionally, during the past seventeen years, Jason has personally interviewed more than 14,000 CEO’s, highly successful entrepreneurs and company owners – an average of 12-14 conversations for each of the 1,200 keynote speeches and workshops he’s delivered since the debut of his first bestselling book. There is no other speaker who can claim the same breadth of fact-based knowledge on leadership, growth, innovation, productivity, culture, and speed. Many meetings can seem like colossal wastes of time, but they don’t have to be. Make meetings something you and your team can look forward to. Here are some helpful ways to get the most out of your next meeting. Positivity is a powerful force that is oftentimes so overlooked. A positive thought, a positive mindset, or a positive point-of-view has the potential to change your entire outlook on any situation. But why is positivity so important? 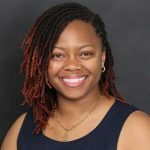 Millennials are known for being one of the most outspoken, sometimes controversial, and complex generations in history. 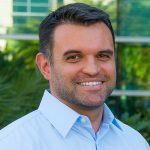 Why it’s more important than ever for employers to understand how to engage and retain millennial employees. 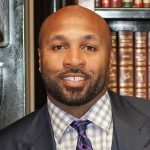 Click here to listen to powerful information about building and keeping the culture you want to have. 10 minutes of gratefulness daily reduces stress, lessens anxiety, leads to emotional health, promotes self-awareness and generates kindness. When it comes to facilitating change in business, or inspiring employees, there is no commodity more valuable than trust. Trust is especially important with regards to employees and leadership. 5 Proven Ways to Gain Trust with Employees. Leadership at most companies gets distracted by bright shiny objects which is why 99% of initiatives don’t work. The Drucker Institute reports that public companies with higher social values have a 20-25% better financial performance than their competitors.